The city of Henderson opened Purple Heart Plaza on Tuesday, coinciding with National Purple Heart Day. The plaza is located at 101 Market St., at Pacific Avenue in downtown Henderson. The new linear park has a shaded seating area, game tables and landscaping that creates a small gathering space. The plaza features the nationally recognized Purple Heart Monument along with a donor brick program that allows the public to purchase engraved pavers to honor someone who has served in the U.S. Armed Forces. The pavers will be installed in Purple Heart Plaza. "Honored and Remembered" veterans need not be Purple Heart recipients. More information can be found here . Created in 1782, the Purple Heart is awarded to any member of the U.S. Armed Forces who is wounded or killed in action. 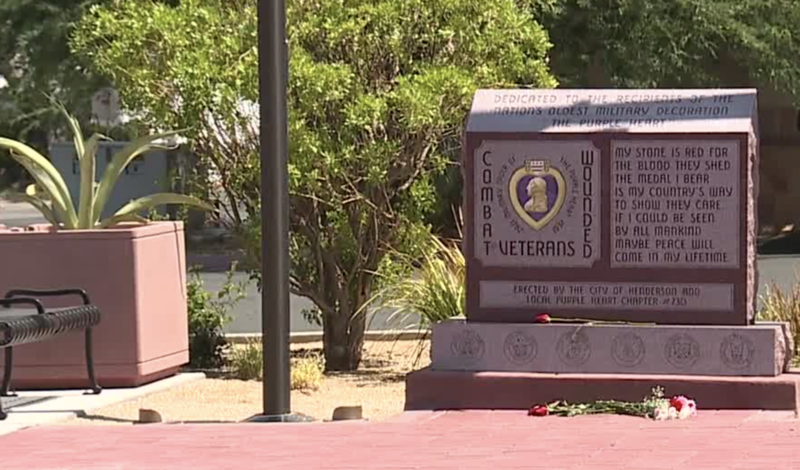 Henderson became the first Purple Heart city in the state of Nevada in January 2014. Purple Heart Plaza will be open 6 a.m. to midnight, seven days a week.